List Rules Vote up the most heartwarming proposals on television. TV marriage proposals come in many shapes and forms, but they all have one thing in common - they’re memorable. Iconic TV couples usually spend multiple seasons falling in love and getting over the whole will-they-won’t-they drama. When they finally take the leap, it’s a big deal for the TV couple and for fans alike. Viewers become invested in these fictional relationships, especially the sweetest wedding proposals on television. So when an engagement finally happens, it can be as exciting as your closest friends deciding to wed. Simple, silly, or elaborate, the best marriage proposal TV scenes usually have the audience reaching for the tissues. Whether we’re talking about funny marriage proposals from sitcoms or romantic proposals from more dramatic TV shows, it doesn’t even really matter if these couples lived happily ever after. All that matters is that our hearts skipped a beat when one of the characters decided to drop on one knee and propose. With so many great shows to choose from, it can be hard to pick the best of the best. Here are the most swoon-worthy marriage proposal scenes from TV shows. Vote up the best moments when a character proposed to their onscreen love interest. After weeks of preparation, Chandler blows his big restaurant proposal after an unexpected encounter with Monica’s ex, Richard. But a little bump in the road can’t prevent these two from getting their happy ending. Eventually, Chandler ends up being the surprised one when he gets home to find Monica kneeling, ready to pop the question. What follows is one of the most romantic moments in Friends history. Brooklyn Nine-Nine’s Halloween episodes are some of the best the show has ever blessed us with. In Season 5, however, the episode is even more special as it marks Amy and Jake’s engagement. 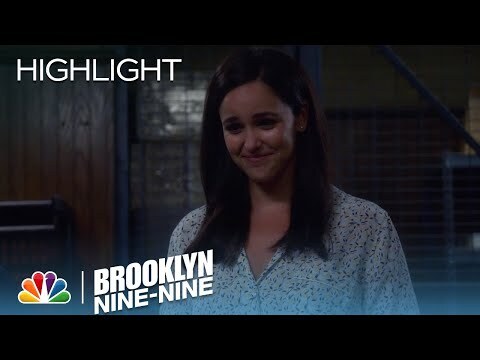 Jake uses the precinct’s annual Halloween heist as a means to surprise Amy with a sweet and elaborate marriage proposal. The adorable exchange that precedes popping the question only shows how perfect these two are for each other. In true Barney fashion, he engages in a complicated ruse meant to make Robin jealous and get her back. He resorts to one final play from his womanizing playbook: “The Robin.” When Barney proposes, viewers are just as shocked as Robin is. Too bad their happiness doesn’t last for long. Patrick surprises David with a proposal that even the cold-hearted could cry at. The couple plans to picnic at the end of their hike, and as David prepares the blanket and champagne, Patrick asks him to pull "something else" out of the front pocket of his hiking bag. When David turns around, rings in hand, Patrick is on his knee explaining how lucky he is to have his love reciprocated by the man of his dreams.